Beautifully restored and brought back to life. 1 of 2 Germain Grand Pianos known to be in existence. Built in the early 1890's in Saginaw, Michigan by the Germain Piano Company - the Golden Era of American piano manufacturing, the beautifully figured sapele mahogany cabinet and ornately hand carved legs are works of art unto themselves. The original action was the well respected Wessell, Nickel and Gross, available in high end instruments. The piano has been modernized with a new carbon fiber Wessell, Nickel and Gross action custom engineered to the piano resulting in a touch that would please the most discriminating player. A must see and play for the serious pianist/investor. The meticulous details of this restoration make all the difference. Even though we've conducted a 5 year search for other Germain Grand Pianos, we've only located 1 other; it is currently part of the Germain Instrument Collection in the Castle Museum in Saginaw. If you know of any others, we'd love to hear from you! 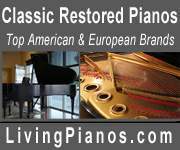 Serious inquiries only, please to Nancy @ Forte Piano Gallery & Restoration Center show contact info , members PTG, MPT, NAMM. 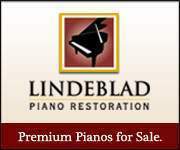 Over 40 years service, commitment and integrity in the piano industry.